Silence Collide has been out for a little while now, and we’ve been hard at work on the next set of releases. A couple weeks ago Pat Aeby recorded drums for “Uninvited,” “All Scarred And Alone” and “One Of Those Days” in Lausanne, Switzerland. Then I recorded bass for those songs last week in Austin, TX. Now James and I are out on Long Island, NY at James’ place recording vocals and guitar top finish up these recordings. Post-production on the second Ep stalled while we started working on these songs, so we figure that these will be released as our third Ep sometime this summer. Work on the new Atomic Brother Ep, Silence Collide is done and is now on the way to iTunes, AmazonMP3, Napster, eMusic, Rhapsody, Shockhound and more. The Ep features 3 new songs, plus 2 live acoustic tracks. 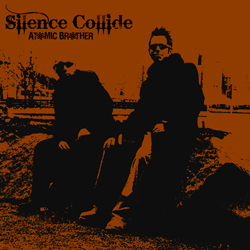 You can get Silence Collide before it’s released directly from Atomic Brother at http://music.atomicbrother.com or by clicking on Music in the sidebar under Merchandise, where you can name the price you want to pay, and you can get the Ep in AIF, MP3, ACC, Flac and WAV file formats. In addition, you will get the digital artwork PDF and the “Making of Wastin’ All My Time” video as a bonus. The last couple weeks has been pretty hectic. I spent a week at 5th Street Studios in Austin, TX mixing “Silence Collide,” “Hands Up,” and “Perfect Day” with our engineer Craig Sadler. Craig did a killer job mixing the three tracks, in what seemed like record time! The next day I flew to New York to join James to record vocals, guitars and bass on “As Far As I Can Go” and “Sin Is In” for the next Ep at James’ place on Long Island. We made a make-shift studio in his place and spent 12-hour days recording all the parts before I was back on the plane to Austin. We’re now mastering the songs with Joe Lambet (who mastered our Elected and See Me Comin’ releases) and working on the artwork. With this being a digital-only release it’s easy to skimp on the artwork, but we feel that images are a big part of the recordings; digital or physical! We get the tracks back from mastering later next week, and if the artwork is done at the same time, it looks like we’ll be in iTunes in November. If you can’t wait until November, everyone on the Atomic Brother mailing list will get a free download of the 5-song EP. If you aren’t on the mailing list, enter your information in the side bar. We’ll let everyone know how to get their free copy before it’s in stores. Since we’ve been on Twitter, we’ve been a little lax updating the news/blog portion of this site. So, here’s what’s been going on. We wrapped up recording all the demos and moved on to recording the final versions of songs. It looks like we’ll be releasing several EPs over the next few months. The first one is being mixed this week. The EP is called “Silence Collides” and features the songs “Silence Collides,” “Perfect Day,” and “Hands Up.” These tracks have James on vocals and guitar, Sebastian on bass with drums by Robert C. Kelly. The guitar and bass were recorded in my old studio in NJ, while the drums were recorded at the university Rob is currently teaching at in Seoul, Korea. We are mixing at 5th Street Studios in Austin, TX. While all this is going on, we are working on the next EP. This one will feature the songs “Bullet From My Brain,” “Sin Is In,” and “As Far As I Can Go.” The bass for “Bullet” was recorded in my old NJ studio, while the bass for “Sin” and “As Far” were recorded in my new studio in Austin. We’ve got 2 drummers on this one. Rob returns for “Bullet” and Pat Aeby (who played on See Me Comin’) is on “Sin” and “As Far.” I’ll be packing the laptop and going back to New York this weekend to record James’ guitars and vocals to finish this one. Release dates for both these EPS, and how you can buy them or get them free will be coming soon! In the meantime, follow us on Twitter to keep up-to-date! http://twitter.com/atomicbrother. On Saturday, April 4, we were back at my studio to finish recording Hands Up. The plan was to record the vocals and some acoustic guitar, but things took a different turn. Even though we had been recording and performing the song the way we recorded it, James wasn’t exactly happy with the overall “feel” of the song; that the guitars were a little to loose. So we ended up revisiting the guitar parts and came up with a much more slamming version of the song. The new part we came up with locks in tighter with the drums and bass, instead of wandering around, and adds a lot more thump and crunch. But, this meant re-recording all the guitar parts we did the week before. No big deal, just an hour or so wasn’t too much time to get something we were much happier with. After that, it was on to the vocals. We had been recording demo vocals for all the songs, so it was just a matter of James rehearsing his part during the week, finding the perfect mic, and recording the performances. I dug out a bunch of mics and we did a mic shootout to pick the best one for James voice and hit it. After we were done we took a few listens and decided to ditch the acoustic and go with the heavier version of the song. The next week I’ll be cleaning up the tracks and getting the song ready for mixing and mastering. For the techies: We used the same guitar setup as last time. The vocals were recorded using a Carvin CM-87S condenser mic through a Focusrite TwinTrack Pro with a touch of compression. Everything is recorded into Logic 8 Pro using a Mackie Onyx 1620 and MOTU 896HD. With the demo sessions for “Hands Up” in the can, this week we moved on to recording the final version of the song. On Friday morning drummer Rob Kelly recorded the drums. Rob has been living and working in South Korea as a drum professor, so he recorded his drums remotely at the school. We did a Skype call before his session to go over some notes, and make sure he got all the stems imported, and he got to it. Rob ended up having some fun and sent us 7 different versions of the drums parts to choose from. For the techies: On this song James is playing his Black Les Paul Custom through his Marshall amp and Mesa Boogie 4×12 cabinet. We mic’d the cabinet with an SM57 towards the edge of the bottom right speaker, and an SM57 towards the center of the top left speaker to capture the full range of his sound. Each mic on its own didn’t give us the depth we wanted. I’m playing my Ibanez SB1200 bass through my Mesa Boogie 4×10 cab with MarkBass bass amp. We mic’d the bass cabinet using a Heil PR-40. Even since before we released our first album, See Me Comin’ in 2007, we’ve been hard at work writing new songs for a new… well, a new something. In October we started going through all the songs we’ve written since then, and even went further back to revisit songs that didn’t make the first album, and started recording demos of them. You can join us each week, usually Saturday or Sunday afternoons, while we’re in studio recording at our channel at http://mogulus.com/atomicbrother, and comment on the songs as they are being worked on and join us in chat sessions. Maybe even catch a live set once in a while. When we’re not in studio you can stop by the channel and watch replays of that week’s session, sessions from the previous weeks and episodes of our podcast. It’s been real fun seeing who stops by, chatting and hearing what everyone has to say. Stop by and say hello! Beginning January of 2009, Atomic Brother will be hosting “Teen Strong: America,” a series of benefit concerts to raise money for teen and youth centers across the country. Our goal is to hold at least one benefit every other month, increasing in frequency until we have successfully reached out to the highest number of teen centers in every state. Each event will vary in size depending on how many teen centers are involved; there is no minimum or maximum, but we hope to involve at least 10 teen centers in each state. Teen centers and youth programs provide a valuable service to teens, providing a safe, positive and friendly environment for teens to gather. These teen centers foster a sense of respect and responsibility, giving teens the tools to get through these tough transitional years. To provide these services, teen centers depend on corporate and private donations, town funding and fund-raising efforts from within their communities. With “Teen Strong: America,” Atomic Brother is helping to raise money so that these important non-profits are able to continue providing their valuable services to the teens of America. Each teen center which attends the show will receive 100 tickets which they will sell for $10 each, whether to fellow teen center members or to friends and family—and 100% of the proceeds from ticket sales will be given directly back to the centers as a donation. For more information about Teen Strong: America, or to find out how you can become involved visit our site at http://teenstrong.atomicbrother.com. Week 5: We were back in studio on Sunday, Nov. 16 working on the song “When It’s Over.” This is a song that we wrote for the first album, and it’s one of our favorites, but it wasn’t quite ready for recording. So we’ve been tossing it around in the rehearsal studio and playing it out at shows every now and then, and it’s finally ready to be recorded. You can watch this session and the sessions from the last 2 weeks over at our Mogulus channel at http://mogulus.com/atomicbrother.